Largest, rarest and most dangerous of the Merwyrms are the Infernal Sciowyrms. Found only in the Boiling Sea off the West Coast of the New World, these creatures are as deadly on land as they are in the water. Unlike all other Merwyrms, the Infernal Sciowyrm lays its eggs on land. Perhaps this is because the largely deserted broken coastlands of the Boiling Sea are less dangerous than the teeming minerally supercharged waters of the sea itself? The greatest of all the sea creatures of the Oceans are known to come to feast on the plankton blooms of the Boiling Sea, the huge fish shoals that gather to feed ...or indeed on each other! Undersea magma flows are a feature of this dreaded area, and the Infernal Sciowyrm is specially adapted to these roiling seas. Its body processes poisonous minerals into a toxic lymph, which allow it to withstand the sulphurous fury of the Ocean floor, and which it can spit great distances when hunting on land. Beastmasters attempting to exploit the faunae wealth of the region are well advised to beware surprise attacks from this Apex predator. Once per shooting phase the Infernal Sciowyrm can make a shooting attack with a range of 24”. The attack uses the small round template, and all models touched by the template receive D6 S8 hits with the Poison special rule. Place the template within range and roll to hit using Ballistic Skill as normal. If the roll to hit misses, scatter the template using the scatter dice. Way too powerful if it is just for fun. M2D6 rather than M6: that's an enormous sea creature, it is very bulky on land. Furthermore, they are never really controlled. Hence I'd make them random mover. BS0: I don't see how a sea creature could spit, and even more spit accurately. Fine to keep poison, though. T8: most hits only scrap its skin and cannot reach anything vital. I1: for what it matters. A4: There's no justification for more. But make them heroic KB and poison to reflect the very large mouth. Ld5: but make it Unbreakable: it knows no foe and cannot imagine to give up. 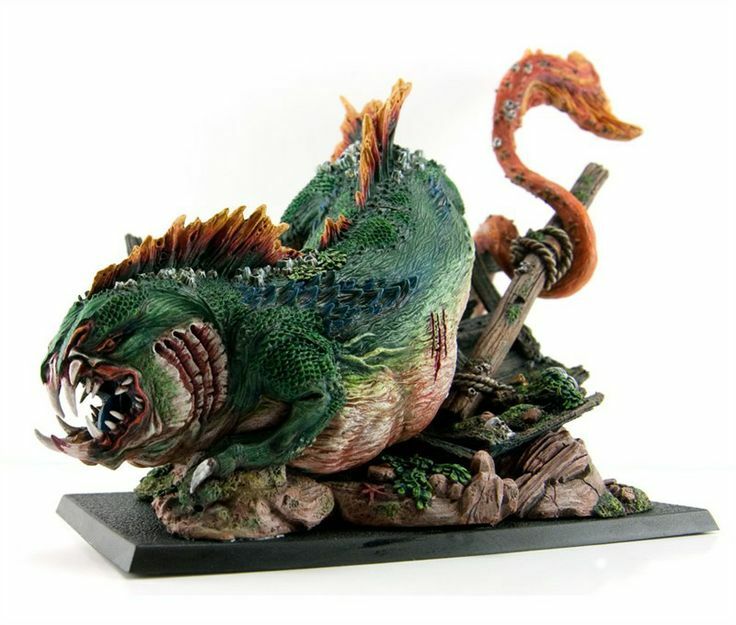 Pts 140: a K-beast can be bought alongside in a 1200pts sea monster mash. Scaly Skin (3+), Regenerate (5+) no, large chunks can be removed. - opponent has to overcome terror or 2/3 attacks will miss; otherwise usually 1/3 attacks will miss, a whale is hard to miss. - up to S6, they would only wound on 6, anything else is mere cuts. - with 10 wounds, it requires some 60 successful attacks, that will keep the butchers busy for a while. No need for regen (why would it be negated by fire? ), nor any armor. - in case the opponent attacks with a monster, then the perspective of KB & multiple wounds is a Russian roulette. Overall, it can definitively be killed but it is not that powerful, hence price goes down. Result should be fun for both opponents.